The Russian Ministry of Defense has branded new claims by the US ambassador to Ukraine as “crystal ball gazing.” The ambassador tweeted pictures of what he said were Russian armed forces in Debaltsevo, eastern Ukraine. 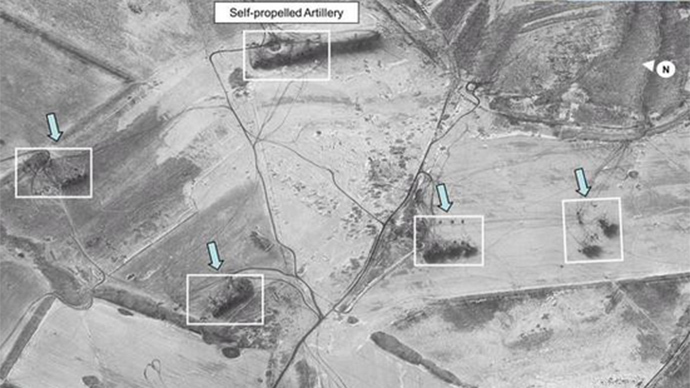 On Saturday, the US ambassador to Ukraine, Geoffrey Pyatt, posted on Twitter what he says are satellite photos proving there are Russian artillery systems stationed near the town of Lomuvatka, about 20 kilometers northeast of Debaltsevo. The images could not be immediately verified. Under the tweet, he said: “We are confident these are Russia military, not separatist systems.” The photographs were commissioned by the private Digital Globe satellite company. “We have failed to understand how those grainy dark patches in the photos published by US Ambassador to Ukraine Geoffrey Pyatt on his Twitter feed could prove anything,” Major General Igor Konashenkov, a spokesman for the Russian Defense Ministry, told journalists later in the day. On Friday, Psaki declared that in addition to the artillery systems and multiple rocket launchers, Russia had also deployed air defense systems to the area near the surrounded railway hub. “This is clearly not in the spirit of this week's agreement. All parties must show complete restraint in the run up to Sunday,” Psaki told reporters. In late July, the Russian Ministry of Defense spoke out against images posted by Pyatt on his Twitter account, which alleged that Ukraine had been shelled from Russian territory. “These materials were posted to Twitter not by accident, as their authenticity is impossible to prove – due to the absence of the attribution to the exact area, and an extremely low resolution. Let alone using them as ‘photographic evidence,’” Konashenkov said at the time. Konashenkov branded the scheme “an informational merry-go-round.” The general outlined the cycle as follows: US counselors in Kiev feed false information to the Ukrainian media, and the news is then presented as fact by official Washington representatives. Also last year, Pyatt was found guilty of posting fake images of US drills and tanks taking part in exercises, after internet users immediately noticed the photographs had been published at a much earlier date.